Our 2017 Sierra blew a front differential and the dealer said that I had it in 4wd while pulling a trailer and that was the cause. I know for sure I didn’t have it in 4wd as I checked several times. Why I checked is because I was burning more fuel than usual and it felt stiff. I have pulled trailers for many years and even travelled for 3 1/2 years solely in a trailer. Has anyone had problem with it switch to 4wd on its own? Did you buy the truck new? I would check with your dealer and see if there has been any updates (TSB's) done to the truck. 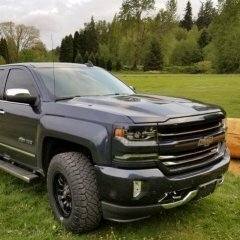 There are a few post on here about trucks being stuck in 4WD and the owners not knowing about, and other problems with the system. Not enough weight taken off to prevent damage on dry pavement. A 4WD on dry pavement is usually fairly obvious, howling noise, crow hoping in turns etc. Now if it was in auto 4WD that might be a different story, the OP might want to press the dealer, and I mean really hammer them to prove it was in full time 4WD. “Crow Hopping” - what a perfect explanatory term. OP best of luck with this. IIRC there have been a few cases of the transfer case being unknowingly engaged. I agree that a review of any/all updates your truck has had is in order. You should have easily felt the difference if it was engaged while driving on dry pavement. How or what is the dealer using to determine that you were towing in 4WD? What were you doing when it failed? What else can you add to your description of events? 4x4 hi or low on dry pavement with a heavy load would be very hard in a locked diff. Especially under deceleration and turning. I don't see how it would be less unless it was hard acceleration. Straight line, no turning, or awd/full time 4x4, no way towing causes issues. It protected by a clutch. Thank you everyone for your comments. I made it back home and took the truck to our hometown dealer and they can't find anything wrong with the front differential. The previous dealer changed the diff fluid and my dealer said something filings should show up in the new fluid if there was a problem. Can't believe the other dealer wanted to change me $5000 for a rebuild and there was nothing wrong. Wait, so it went from the diff is “blown”. As in no 4WD - the front drive not functioning, to we had them change the fluid and drove it to a hometown dealer and now it’s fine? He's explaining what dealer #1 told him...which is seems he did not buy into. Had them change the fluid. Smart. Drove it to somebody he trusted who found it to be fine. His initial reaction in the opening post wouldn't be any more unusual than that of a person being told they have cancer when they don't. An expression of shock and disbelief he shared. No need to embarrass or belittle the fellow. He's still in disbelief over the untrustworthiness of a 'dealer' and shared that too. That act, would it incense a fellow of low moral character? Not likely. Brave man to tell you so much about himself, IMHO. To open up in a tank of sharks. Yes, it would be a heavy load on the diffs, but not the front one because of turning locked in 4wd. All the towing does is make it easier for the front tires to scrub.